WESTBROOK – The improvements to William Clarke Drive, which are expected to be finished over the next few weeks, are geared toward drivers and pedestrians, who both have to use the busy roadway. But a series of four signs on the road are designed to accommodate yet another frequent class of road users – bicyclists. 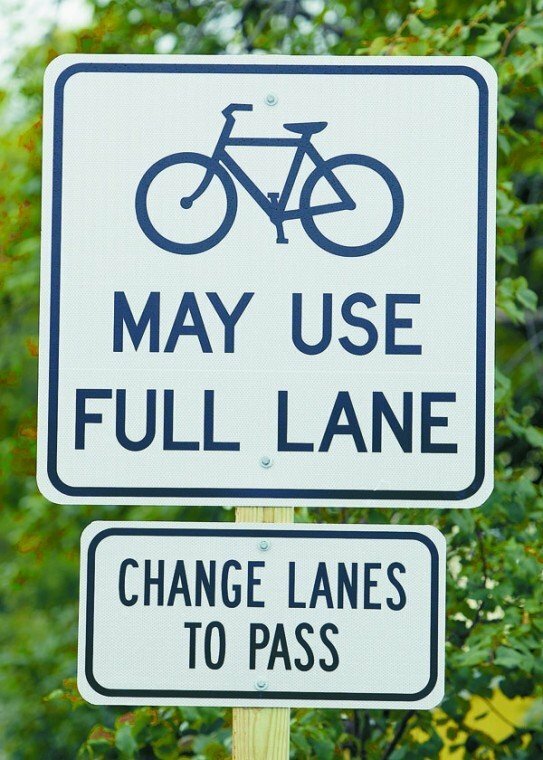 The signs depict a drawing of a bicycle, with the words, “May use full lane.” They are a reminder to drivers to share the road with bicyclists, according to Westbrook resident John Brooking. He is a bicycle commuter, advocate for bicyclists’ rights and organizer of the web-based group Portland Maine Bicycle Commuting Meetup. “It’s basically a regulatory sign that informs people of what the law allows,” he said. The law allows bicyclists to use travel lanes as though they are vehicles, with the right to use the full lane if the riders wish, Brooking said. Signs along William Clarke Drive will be a welcome sight to residents who worry about riding a bike in the road, Brooking said. “There are a lot of bicyclists along those residential streets,” he said. The signs were approved for road use by the Federal Highway Administration, a division of the U.S. Department of Transportation, in 2009, but they are still new enough that Brooking had to lobby the state Department of Transportation before the signs went up. “Our DOT is not used to thinking about those signs because they’re new,” he said. The signs are installed at the road designer’s discretion, Brooking said, much like signs announcing pedestrian crossings, or warnings about fines for littering. Brooking said he thinks the William Clarke Drive signs may be the first to be used in the state, and he is working with Portland officials to get the signs installed in that city, possibly as early as next summer. Dan Stewart, bicycle and pedestrian program manager at the Maine Department of Transportation, said there is no data available measuring the effectiveness of such signs in preventing accidents, but said they are useful where there are no bicycle lanes, like along William Clarke Drive. “When you don’t have room for bike lanes, these signs will help,” he said.